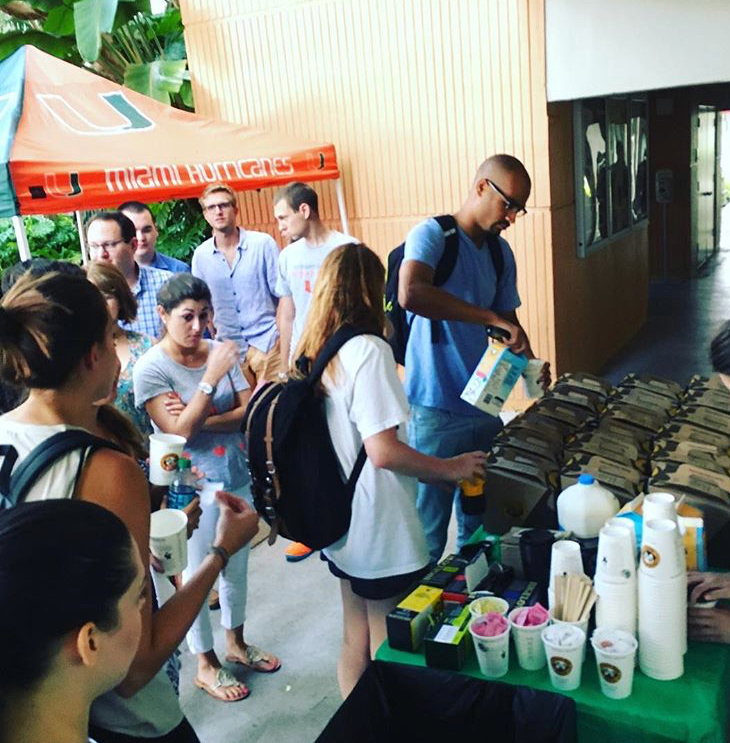 Coffee Connectors Network provides law students and alumni with opportunities to connect with Miami Law alumni across the country. With our network of alumni, our law students and alumni can connect with a diverse group of attorneys, obtain opportunities to learn about different practice areas and ultimately receive assistance to transition from law school into practice. With more than 18,000 alumni worldwide, the Miami Law alumni network is an amazing resource – professionally and personally. At Breakfast with the Bench, students will have the opportunity to enjoy breakfast with state and federal judges in South Florida to learn more about judicial internships and postgraduate clerkships. Breakfast with the Bench is open to all 1Ls, 2Ls, 3Ls, and LLMs and is free to students. For information contact askus@law.miami.edu. At Evening with Esquires, students will have the opportunity to enjoy dinner with local attorneys representing different fields of law in South Florida. In the past we have invited lawyers practicing in the following areas of the law: Real Property, Trusts & Estate, Environmental / Maritime, Family Law, Tax Law, Entertainment Law, Sports Law, Business and Corporate, Bankruptcy, Intellectual Property Law, Litigation, and Criminal Law. For information contact askus@law.miami.edu. Legal Grounds is an initiative that allows students to interact with professors 1-1 to discuss courses, academics and post-grad opportunities, and provides an opportunity to students, faculty and administration to enjoy coffee and bagels in an informal setting. It occurs every Thursday from 8:30-10:30am on the Bass Bricks, and is an initiative started by the AskUs program in collaboration with Professor Andres Sawicki. Legal Grounds is sponsored by LAFAC. The University of Miami School of Law Young Alumni Committee hosts a monthly Table of Eight dinner which offers Miami Law young alumni an invitation to dine with a distinguished Miami Law alumnus. Seating is limited to seven young alumni on a first-come, first-served basis. (These are not fundraising events and the event covers the meal and related charges.) For more information contact Jesse Barone, Coordinator, Alumni Communications and Research at: jbarone@law.miami.edu or call 305-284-3470. Now in its 26th consecutive year, Partnership for Professionalism is scheduled in the fall and spring of each academic year. Judges, attorneys, and law students attend informal roundtable discussions during a buffet dinner. At each of the tables are seated a judge, three attorneys, and six students. Prepared scenarios that present issues of civility, ethics and professionalism are discussed at each table, followed by summations by the students coordinated by MiamiLaw alumni. Many of the judges and attorney participants are veterans of the programs attended while they were students at the University of Miami School of Law. The Florida Bar eMentoring Program pairs practicing attorneys with law students throughout the state. The mentors provide support and encouragement, offer career advice, and strive to enhance professionalism within the legal field. The Cuban American Bar Association Mentor Program matches mentors with law students based upon the student's interest and the mentor's area of practice. The association also hosts receptions for mentors and participating students, and invites students to participate in many of its events throughout the year. The John W. Kozyak Minority Mentoring Program pairs minority students with community attorneys and members of the judiciary who serve as mentors throughout students' law school careers. Meeting at mentors' offices, in the courtroom, and at community events, mentors and students often continue their relationships as professionals after graduation. The Young Lawyers Division of the Florida Association of Women Lawyers (FAWL) has a Law School Mentoring Program, which works with FAWL chapters in establishing partnerships with Florida law school FAWL chapters to mentor students and young lawyers. The University of Miami School of Law's student chapter of the Dade County Bar Association does not have a formal mentor program but the mission and goals of this organization are very similar to a mentor program. The Career Development Office publishes a Networking Guide and a Networking Guide for International Students. Whether seeking a job upon graduation, looking for an internship or externship during the academic year, or simply wanting to develop a network of contacts, it is never too early to think about how to build professional contacts. The Career Development Office encourages students to have professional business cards to enhance their networking experiences. Please contact the CDO at cdo@law.miami.edu with any questions about ordering business cards.